Birkenhead Church of God, like many of the churches in Europe, is reaching an increasingly secular and post-Christian society. “Be Known, Be Loved, Be Community” has become the church’s motto as we seek to engage people. We have been consistently met with hesitation and skepticism as we introduce ourselves to neighbors. Preconceived notions and barriers make relationship-building slow. We launched a “Toddler Stay & Play” last year. Costs of similar groups are often expensive for our low-income neighbors. The church took a risk, created a welcoming space, and hoped. We now meet for our tots’ group twice a week with eighteen to twenty-eight kids and regular new visitors. Our reputation for quality toys, activities, and kindness precedes us. No longer do people enter timidly with eyes diverting in case we try to “convert them.” Instead, our volunteer Janet has been nicknamed “Granny” and many kids greet her with a warm hug as she helps them out of their coats. When she started, she was too timid. She questioned what she could offer these young people. She worried she wasn’t knowledgeable enough. She was concerned she wouldn’t be able to share Jesus well enough. We encouraged Janet to simply learn every kid’s name, to make the effort to welcome and follow through on our church motto. In a recent conversation, Janet shared that she has learned to understand the love of Christ so much more through loving these families. She didn’t need the right words, and discipleship is no longer only Bible study, but also active engagement in the lives of others to show care and grace. Jesus shared this seemingly upside-down kingdom vision—we must serve and love others. Because Janet has loved well and truly embodied servanthood, she is warmly invited to birthday parties and into deep conversations and has even been asked to pray for many families. What a beautiful reminder of the power of love! Hospitality, or “table ministry,” has been a huge part of who we are. For years, we have met weekly around our table with young adults. We have laughed, eaten together, and done life together. 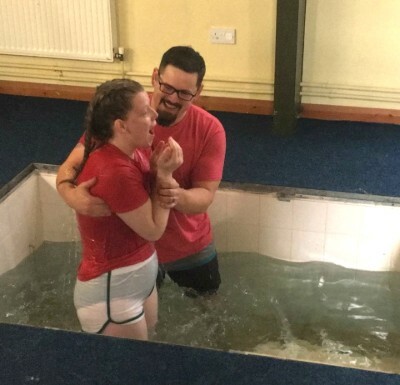 Zach Langford baptizes a new believer at Birkenhead Church of God. Conversations have varied from minor to serious. Sunday night dinners have been a huge relationship-builder and highlight of the week. Many who enter our home are not believers. They start coming for a good meal and end up connected as friends. We have been invited to discuss our faith on many occasions. One such moment will stick with Audrey forever. After a morning walk with two friends, she invited them for lunch. The women talked together in the dining room while Audrey made fajitas for lunch. Out of nowhere, the women asked, “What is your favorite thing about Jesus?” All Audrey could think of was, “Wait, what?” They are both atheist and very open about it. She took a moment and shared the powerful story of the woman at the well. Fast forward a few months, and one of those women became a volunteer for our youth club. She even joined us a chaperone for IYC2018, where she accepted Jesus. She, along with two others, were baptized in December! We have been blown away, time and time again, how the Holy Spirit moves in the ordinary; how icing cookies can lead to conversations about faith! 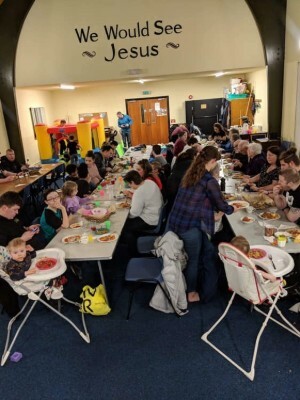 In March 2019, we decided to extend our Sunday night dinners from a young adult small group at our home to an all-community meal once a month at the church. Our first event had sixty-three in attendance. One of our church members looked around the room and noted she only knew about a quarter of the people. What a cool opportunity to share hospitality in the ordinary, and maybe be invited to share our favorite thing. Editor’s note—In an update to supporters on April 8, Zach and Audrey Langord announced that their current visa was, unexpectedly, not renewed. Click here for their full report and details on how you can pray. Zachary and Audrey Langford serve as missionaries for Global Strategy to the United Kingdom. Learn more about them and discover opportunities to support their ministry at https://www.chogglobal.org/team/zalangford/. This entry was posted in All Church of God, Give Life, Global Strategy and tagged 3 Worlds, 3W, Audrey Langford, baptism, baptize, Birkenhead Church of God, childcare, community, discipleship, England, Europe and the Middle East, Europe-Middle East, evangelism, Global Strategy, IYC2018, Jesus Is the Subject, JesusB, leadership development, meal, mentoring, Missionaries, missions, outreach, post-Christian, Three Worlds, toddlers, training, UK, United Kingdom, upside-down kingdom, visa, visa renewal, Zach and Audrey Langford, Zachary Langford. Bookmark the permalink.